WildEarth Guardians welcomes the release of a captive-bred, 4-year-old male, called M1133, to the Apache-Sitgreaves National Forest of Arizona. 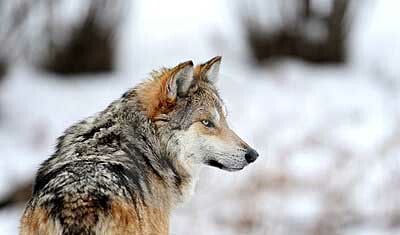 The release of M1133 marks the first liberation of a captive wolf since 2008. We hope he will mate with the lone alpha female of the Blue Stem pack—if he can find her in time for the breeding season. (Her previous mate was illegally shot last year.) M1133 is one of less than 60 lobos remaining in the wild that are up against some difficult foes, primarily the livestock industry and some hunters. WildEarth Guardians is working to buy out ranchers, releasing their grazing permits thereby giving Mexican wolves more freedom to roam. To visit the website of Wild Earth Guardians or help with a donation, click here. In June of 2012, Juhi Sheth, a supporter of Samabhava, spotted Bronco right in the middle of Dr. Ambedkar Vedhi Road, in Cubbon Park, a large park in central Bangalore. Traffic was rushing around him in both directions, and Bronco looked confused, unsure which way to go or what to do. Juhi stepped through the traffic and led the horse to safety along a footpath. Then she had to let him go, having at that moment no place to take him. She called Samabhava, who were, as always responsive to the plight of a horse in distress. Over the next three months, Samabhava undertook six different “catch and shift” missions to catch Bronco in order to re-locate him to a safe place. Unfortunately, no one could really explain to Bronco the advantages of being caught. They could find him in the same general area, but as for actually catching him, he was elusive. On their seventh try, they set out, expecting to spend the entire day in another vain attempt to catch Bronco. Amazingly, within five minutes they had him and were able to transport him the same day to the rescue center at Krupa, where he’s been making the acquaintance of the other rescued horses there. So far, Survivor and Zuma are still teasing him a bit, but he has become good friends with Biscuit. No longer in danger from rushing traffic, he is doing well. It appears that he had been hanging out at Cubbon Park for around five months; he may be over 22 years old and may have been used in something called Gymkhana racing, in which owners of non-thorough bred horses race them. Juhi Sheth and her brother Abhishek Sheth are sponsoring Bronco now so that he can lead a life surrounded by kindness, safely away from the uncertainties and dangers of wandering without a home. Sponsoring one of the horses rescued by Sambhava generally costs around 5,000 rupees a month ($93). To visit the Facebook page of Samabhava and read about some of their other rescued horses, click here. Chennai, India: A calf saved at Pongal. During the festival of Pongal, having just returned from successfully rescuing a cat who was down a 35 foot well, Dawn Williams, General Manager of Blue Cross, set off again immediately, as soon as he heard about a calf in dire straights. Three Blue Cross volunteers, Mr. Anand, Mr. Murali and Ms. Jennifer, had come across the calf under the Dr. Ambedkar Bridge, near the big shopping center, Chennai Citi Centre. Sadly, they had been heading home following the funeral of their dog, Shearu. They spotted the calf lying on the road, weak and sick, looking just about a week old. The male calf had not seemed very useful to whoever his original owner had been, and now, having been abandoned, he could be found by a passerby and sold for slaughter. In fact, a person claiming ownership of the calf did show up, around the time that Dawn arrived, demanding payment, and insisting that he would not allow the calf to be taken away until he was paid first. Dawn, who could see clearly that the calf was not being cared for by anyone, stood up to the man, threatening to have him arrested. Seeing that he would get no payment, the man left, leaving Dawn to rescue the calf. Dawn rushed the calf, who was very weak, to Madras Veterinary College, where he was put on an IV and stabilized. In the meantime, Ms. Sheela, a Blue Cross volunteer, was preparing a feeding bottle with milk for the calf to feed him just as soon as he arrived back at Blue Cross. With such good care, the calf was soon feeling a little more energetic. 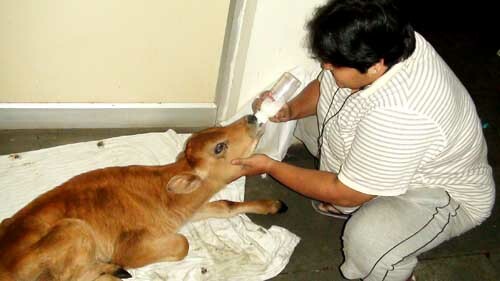 Thanks to quick action by Dawn and Ms. Sheela, the calf is expected to recover. The festival of Pongal is all about the protection of cattle. To visit the website of Blue Cross, click here. The visit Blue Cross’s Facebook page, click here. Her coat had once been shiny and white, but now was matted and streaked with grease. Her ribs showed and she was panting in the sticky tropical heat. Still, she smiled. She ambled inside the indoor Futból 5 stadium where we were hosting a local spay and neuter clinic without hesitation, eyes bright and tongue hanging sideways. She drank at length from the water bowl we promptly offered and let us gently nudge her inside a pet carrier. Less than half an hour later she started to stir, waking up from the anesthesia, spayed, vaccinated, nails trimmed, dewormed and Frontlined. Her surgery had lasted not quite three minutes, one of Dr. Rivas best times ever. We gently loaded her onto the back seat of a small sedan and drove her to Carla’s home to give her a chance to rest and recover. The next morning she wolfed down a nice helping of food and introduced herself to the other resident dogs with such playful enthusiasm that they cheerfully accepted her as the new member of the gang. We named her Katrina and promptly set out to find her a good, permanent home. When we invest our resources in preventing suffering, we turn off the flow of puppies and kittens slowing it to a trickle, one that is easier to handle. When you support our programs, you extend a helping hand to dogs like Katrina, making sure that she won’t contribute to creating another generation of homeless beings. …Without animal welfare, there is no community welfare and, vice versa, our own welfare begins with theirs. Less than $20 does it. 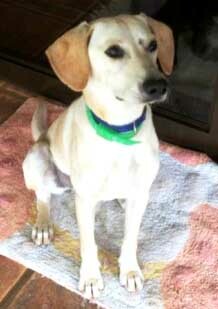 It covers the cost of Katrina’s surgery, her vaccines and deworming treatment. It prevents misery and suffering. It gives hope to the hardworking volunteers that tirelessly continue their advocacy work, delivering without asking anything, simply because they care, because it is the right thing to do. Thank you on behalf of Katrina and her never-to-be-born puppies. Deep down in her heart she is forever grateful. And so are we, grateful that is. Help us continue to do the right thing: one community, one surgery, one Katrina at a time. To read this story in its entirety, as well as other success stories on the SNIP website, click here. 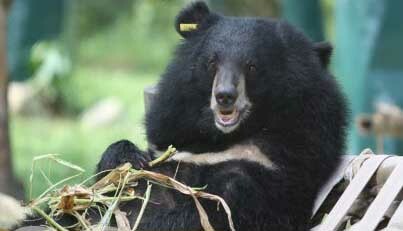 Vietnam: Animals Asia Bears saved from eviction! The threat of eviction has been lifted for the 104 bears living at the Animals Asia Rescue Center in Vietnam! Since October 5, 2012, the bears had been under threat of being forced to leave their rescue center, which would have meant extreme hardship for all the rescued bears. Prime Minister Nguyen Tan Dung issued a communiqué stating that the rescue center will be maintained, and construction on the second phase of the project will continue. The 104 rescued bears will be staying at their homes at the center, and the local staff will be keeping their jobs. Tuan Bendixsen, Vietnam Director, Animals Asia, expressed his gratitude to the Prime Minister and his wish to continue working together with the government to end the practice of bile bear farming and to protect the bear species. Animals Asia runs a beautiful facility in Chengdu, China, for bears rescued from bile bears farms in China, and in recent years opened the Vietnam facility on 12 hectares (29 acres) of Tam Dao national Park to rehabilitate and provide a home for bears rescued from bile bear farms in Vietnam. Bile bear farming is an extremely cruel practice, in which bears are kept in horrible conditions for many years, while their bile is extracted to be used as a form of medicine, even though many effective herbal and synthetic alternatives are available. In China, 10,000 bears are still being held on bile bear farms, and around 2,400 in Vietnam. Animals Asia works together with the Chinese and Vietnamese governments to secure the release of the bears, who must then undergo extensive rehabilitation and be provided sanctuary for life. Congratulations to Animals Asia for this victory, and for the profoundly worthwhile work they do saving the bears! Information was provided by the January 16, 2013 press release written by Stuart Lennon, Senior Communications Manager, Animals Asia. To visit the website of Animals Asia, click here. At around 11am, Dawn Williams, General Manager at Blue Cross of India, received a call from a woman telling him that her three year old son had dropped two puppies down an unused bore well. She could hear the puppies crying. A Blue Cross volunteer, Mr. Kumaravel, went along with Dawn to the spot where the well was. They arrived at the well, which was about 150 feet deep, only six inches wide, and pitch black inside. In the past, Dawn has bravely climbed down a number of wells to rescue trapped animals and carry them up to safety, but with the well being only six inches wide, that wasn’t an option. They lowered a light to have a better look. It was then, sadly, that they realized that one of the puppies had already died. For around three hours they focused on rescuing the puppy that was still alive, using what is called a “puppet rope method,” a way of tying the rope so it could be used to bring up the puppies. 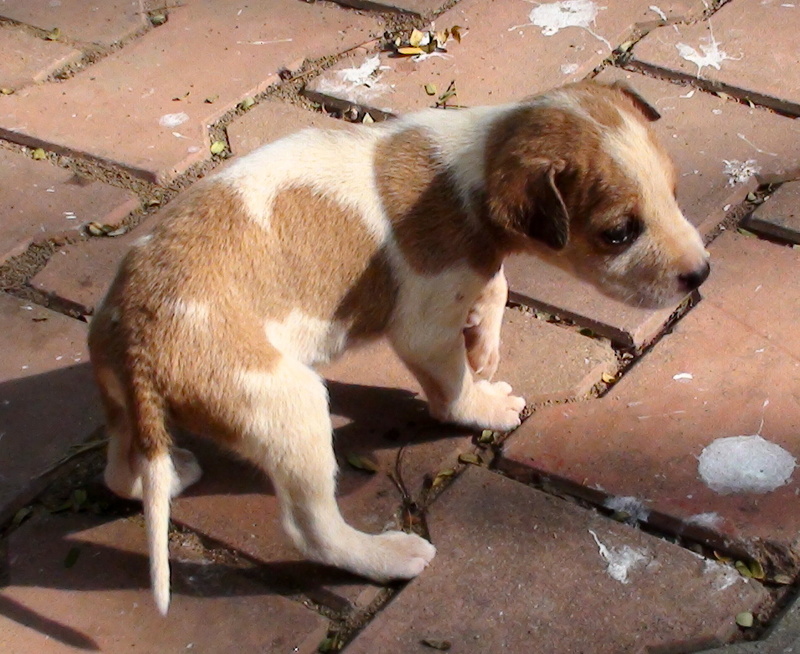 Eventually, they were able to get both puppies, even though one could no longer be helped. The second pup was in desperate shape. Dawn was able to give him CPR, mouth-to-mouth resuscitation, and the puppy began to revive and breathe on his own. Meanwhile a crowd had gathered, and around 25 people were anxiously watching the progress of the rescue and were chanting prayers for the pup. The puppy was rushed to Blue Cross, where he received excellent veterinary treatment, recovered rapidly, and is now doing really well. Thanks to the determined rescue work of Dawn Williams and Mr. Kumaravel, a life was saved. Dawn reports that tomorrow morning the puppy will be reunited with his mom, and steps will be taken to ensure that the mom and her puppy will be safe, loved, and well-cared for in the future. 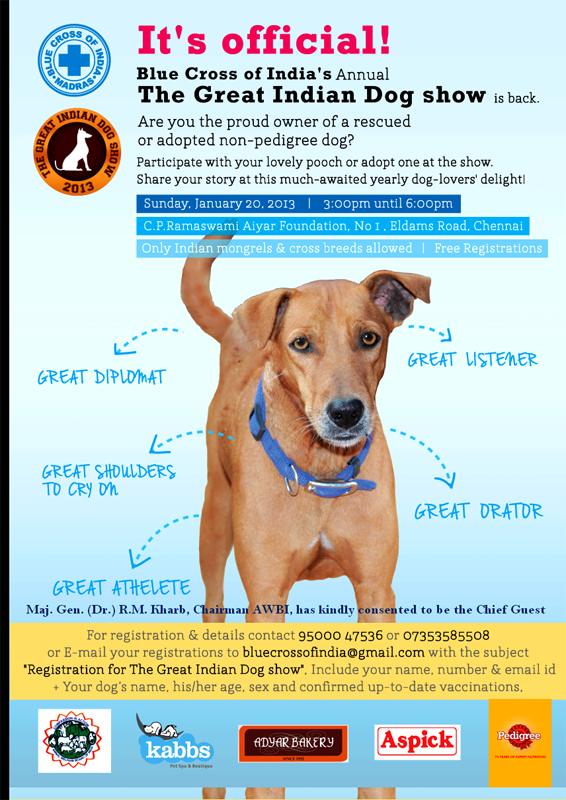 To visit the website of Blue Cross of India, or to donate to help their work saving animals, click here. To visit their Facebook page, click here.